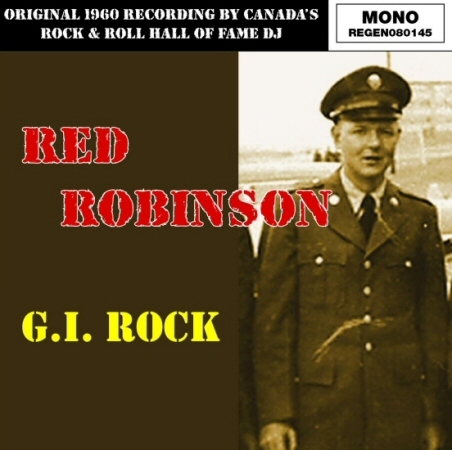 Canada's own rock and roll hall of fame DJ Red Robinson began his career in 1957 spinning Elvis and Buddy Holly records. 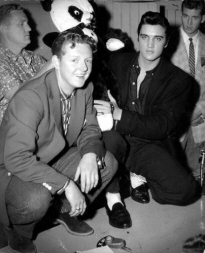 Throughout his amazing life, he has met, interviewed and been photographed with virtually everyone you could possibly think of in Rock and Roll history including The Beatles, Elvis Presley and Buddy Holly. In the summer of 1960 Red began work at KGW Radio in Portland Oregon and received a draft notice to join the army. As a publicity stunt for his radio show, he recorded a song called 'G.I. Rock' in the radio station studio and sent a copy back to Big Daddy Dave McCormick who then played it on the air. It charted very briefly and many listeners phoned in asking where they could buy the record. Unfortunately for the fans, it was never issued commercially and only a few acetate records still exist. To this day Red told us he still gets asked for the song, so we convinced him to release it. Packaged in a photo picture sleeve this 45 RPM is a limited numbered edition of only 500 copies.